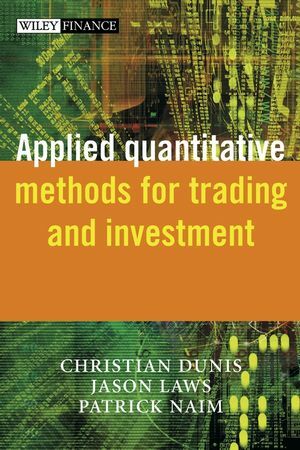 This book provides a manual on quantitative financial analysis. Focusing on advanced methods for modelling financial markets in the context of practical financial applications, it will cover data, software and techniques that will enable the reader to implement and interpret quantitative methodologies, specifically for trading and investment. Includes contributions from an international team of academics and quantitative asset managers from Morgan Stanley, Barclays Global Investors, ABN AMRO and Credit Suisse First Boston. CHRISTIAN L. DUNIS is Girobank Professor of Banking and Finance at Liverpool Business School, and Director of its Centre for International Banking, Economics and Finance (CIBEF). He is also a consultant to asset management firms, a Visiting Professor of International Finance at Venice International University and an Official Reviewer attached to the European Commission for the evaluation of applications to finance of emerging software technologies. He is an Editor of the European Journal of Finance, and has widely published in the field of financial markets analysis and forecasting. He has organised the Forecasting Financial Markets Conference since 1994. JASON LAWS is a Lecturer in International Banking and Finance at Liverpool John Moores University. He is also the Course Director for the M.Sc. in International Banking, Economics and Finance at Liverpool Business School. He has taught extensively in the area of investment theory and derivative securities at all levels, both in the UK and in Asia. Jason is also an active member of CIBEF, and has published in a number of academic journals. His research interests are focussed on volatility modelling and the implementation of trading strategies. PATRICK NAÏM is an engineer of the École Centrale de Paris. He is the founder and chairman of Elseware, a company specialising in the application of nonlinear methods to financial management problems. He is currently working for some of the largest French institutions and co-ordinating research projects in the field at European level. 1 Applications of Advanced Regression Analysis for Trading and Investment (Christian L. Dunis and Mark Williams). 1.3 The exchange rate and related financial data. 1.4 Benchmark models: theory and methodology. 1.5 Neural network models: theory and methodology. 1.6 Forecasting accuracy and trading simulation. 2 Using Cointegration to Hedge and Trade International Equities (A. Neil Burgess). 2.2 Time series modelling and cointegration. 2.3 Implicit hedging of unknown common risk factors. 2.4 Relative value and statistical arbitrage. 2.5 Illustration of cointegration in a controlled simulation. 2.6 Application to international equities. 3 Modelling the Term Structure of Interest Rates: An Application of Gaussian Affine Models to the German Yield Curve (Nuno Cassola and Jorge Barros Luis). 3.2 Background issues on asset pricing. 3.3 Duffie–Kan affine models of the term structure. 3.4 A forward rate test of the expectations theory. 3.6 Econometric methodology and applications. 4 Forecasting and Trading Currency Volatility: An Application of Recurrent Neural Regression and Model Combination (Christian L. Dunis and Xuehuan Huang). 4.2 The exchange rate and volatility data. 4.3 The GARCH (1,1) benchmark volatility forecasts. 4.4 The neural network volatility forecasts. 4.5 Model combinations and forecasting accuracy. 4.6 Foreign exchange volatility trading models. 4.7 Concluding remarks and further work. 5 Implementing Neural Networks, Classification Trees, and Rule Induction Classification Techniques: An Application to Credit Risk (George T. Albanis). 5.3 Neural networks for classification in Excel. 5.4 Classification tree in Excel. 6 Switching Regime Volatility: An Empirical Evaluation (Bruno B. Roche and Michael Rockinger). 6.4 An application to foreign exchange rates. 7 Quantitative Equity Investment Management with Time-Varying Factor Sensitivities (Yves Bentz). 7.3 OLS to estimate factor sensitivities: a simple, popular but inaccurate method. 7.4 WLS to estimate factor sensitivities: a better but still sub-optimal method. 7.5 The stochastic parameter regression model and the Kalman filter: the best way to estimate factor sensitivities. 8 Stochastic Volatility Models: A Survey with Applications to Option Pricing and Value at Risk (Monica Billio and Domenico Sartore). 8.2 Models of changing volatility. 8.5 Extensions of SV models. 9 Portfolio Analysis Using Excel (Jason Laws). 9.2 The simple Markovitz model. 9.3 The matrix approach to portfolio risk. 9.4 Matrix algebra in Excel when the number of assets increases. 10 Applied Volatility and Correlation Modelling Using Excel (Frederick Bourgoin). 11 Optimal Allocation of Trend-Following Rules: An Application Case of Theoretical Results (Pierre Lequeux). 11.3 Moving averages and their statistical properties. 11.5 Expected transactions cost under assumption of random walk. 11.6 Theoretical correlation of linear forecasters. 11.7 Expected volatility of MA. 11.8 Expected return of linear forecasters. 12 Portfolio Management and Information from Over-the-Counter Currency Options (Jorge Barros Luis). 12.2 The valuation of currency options spreads. 12.3 RND estimation using option spreads. 12.4 Measures of correlation and option prices. 12.5 Indicators of credibility of an exchange rate band. 13 Filling Analysis for Missing Data: An Application to Weather Risk Management (Christian L. Dunis and Vassilios Karalis). 13.2 Weather data and weather derivatives. 13.3 Alternative filling methods for missing data.